The Teatro Fernán Gómez is in the Plaza de Colón 4, Madrid in the Salamanca district of the city. It started off life as the Centro Cultural de la Villa, but changed its name in 2007 as homage to the late Spanish actor, writer and film and theatre director, Fernando Fernán Gómez. This cultural and art centre stands in a very peaceful atmosphere, despite the busy road intersection nearby. 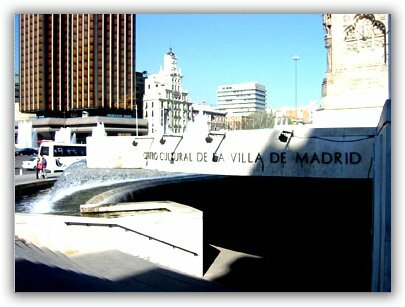 There are fountains and gardens with monuments surrounding the area, which stands just opposite Madrid's Museo de Cera, or Wax Museum. It is one of the primary cultural centres of Spain's capital city and well worth a visit. There's always a lot going on with many things of interest to see. There are a number of stages at the Teatro Fernán Gómez. The main stage predominantly has contemporary Spanish drama, as well as Spanish opera (zarzuela) and that most Spanish of artistic expression - flamenco. Ballet and Spanish folk concerts are also regularly staged here. Another popular stage is the one where the Children's Puppet Theatre takes place over the winter quarter. The season is between autumn and spring with weekly shows every Sunday starting at 4.45pm. There is a spacious exhibition hall of over 2,000 square metres. It is extensively used has become a very prestigious and desirable exhibiting location. The outside spaces surrounding the complex is also made use of as much as possible. It comprises over 21,000 square metres of space. The exhibition hall is open from Tuesday to Saturday from 10am to 9pm. On Sundays and holidays it is open from 10am to 7pm, and it is closed on Mondays. The main auditorium of Centro Cultural de la Villa can hold 838 people, and the conference room holds 308 people. The nearest Metro station is Colón, with the Metro station of Serrano only a short distance further away. Both Metro stations are on line 4. The Centre can also be reached by a number of city buses: 1, 5, 9, 14, 19, 21, 27, 45, 51, 53, 74 and 150. The Centre is open from 9am to 3pm morning and early afternoon, and from 4pm to 9pm afternoons and evenings. If you wish to book advance sales tickets for the orchestral music, theatre works, zarzuelas, and ballet with a Spanish style regularly performed in this cultural centre, you can call them by telephone on 902 101212, or book online from www.telentrada.com. You can also go there in person to the box office during the opening hours of 11am to 1.30pm and 5pm to 7pm, Tuesday to Sunday.